Skype and EasyBits: Mistake or Attack? After a strange reluctance to jump on the issue, the major news outlets have begun covering the excitement of this past Saturday morning, when untold numbers of Skype users suddenly found new software installed on their Windows PCs, without so much as a notification or request for permission from Skype. Skype has been almost silent on the issue, as has the firm that originated the software in question, EasyBits GO. EasyBits is not obviously malware, but there were some weird EasyBits/Skype connections with malware last year, and Saturday’s install certainly acted like malware. So was it a mistake? Or was it an attack? The greatest weirdness of all is that we still don’t know. My take? It looks like a mistake. It smells like an attack. I set up an old XP machine with Skype on it Saturday afternoon, and left Skype running in a window. It’s still running as I write, and there’s no trace of the EasyBits installer. I thought the fact that it was still at SP2 might have made a difference, but I’ve heard from people who got the install on SP2 machines. This suggests that Skype immediately stopped pushing installs once the crap started to fly online, which further suggests that Skype was in control and that it was a mistake rather than an attack. There’s a tendency to love a great story, and we have to be careful not to read more into things than reality warrants. I’m an SF writer, and the futures I’ve tried to predict (as have many other, far more notable SF writers than I) have turned out to be a lot more dramatic and colorful than the future that actually worked itself out over the years. We underestimated small things (computers) and way overestimated big things, like space travel and (yes indeedy!) flying cars. Here’s an example of wearing your SF hat too much: Some years back, I was predicting that malware authors would create trojans that very quietly installed file-sharing nodes behind the screen of rootkit techniques, which would then search for sharable content on the machine and then open LimeWire-style P2P connections to the Net at large. Because it was a trojan, it would provide plausible deniability in copyright infringement lawsuits–and because it provided plausible deniability for file-sharing, people would deliberately infect their machines with it. The trojan would soon be on over a billion machines, and Big Media could do nothing at all about it. That said, there’s still the possibility that a server-side infection was behind the push, and that what we got was a compromised version of EasyBits that may at some later time (patience, patience!) download the Real Deal, whatever that Real Deal might be. And whatever it is, it’ll be about money. The end of the story hasn’t been written yet. Keep your virus checkers handy. Consider Skype alternatives. (Look into Jitsi.) And stay tuned. I immediately did a search for EasyBitsGo.exe on my system, and found the executable at Documents and Settings/All Users/Application Data/Easybits GO/ There are several subfolders as well. There was an app listed in the Add or Remove Programs applet. There was a folder (dated a few minutes later) called “go” in my user tree under Application Data. It contains some kind of a log. Last and worst of all, there were Registry keys in the HKEY_CURRENT_USER subtree under Software/EasyBits. EasyBits is a real company, and they created and have been running Skype Game Channel for some years now. I’m not a gamer and hadn’t run across them before, but they have some history, and don’t appear to be malware vendors. (This does not mean that malware could not impersonate them.) Nonetheless, however they had pulled it off, what they’d done was utterly unacceptable: They’d installed a whole app with no obvious connection to Skype without any warning, much less any request for permission. In Skype, select menu option Tools | Options | Advanced, and un-check Automatically Start Extras. Click Save. Make sure the SkypePM.exe process is not running. If it is, kill it. Go to the Add or Remove Programs applet and uninstall EasyBits GO. It uninstalls almost instantly, which suggests that nothing is actually being uninstalled. This was the case as best I could tell. Find the folder tree at Documents and Settings/All Users/Application Data/Easybits GO/ and delete it. Go to the Application Data folder tree under the user that was active when the damned thing installed, and find the go folder. (It contains some kind of log file.) Delete it. Go to the Windows/Prefetch directory and look for the file EASYBITSGO.EXE-364DAFD6.pf and delete it. Search for and delete all instances of ezPMUtils.dll. They may be in different locations depending on your version of Windows. If you’re comfortable editing the Registry, get rid of the keys at Software/EasyBits as shown in the screenshot above. Reboot. Theoretically that should do it, but if Skype could push this thing down to countless users without their knowledge once, it could do so again. After rebooting, I think it might make sense to update your virus scanner signature database and do a full scan on your system. So whatthehell is going on here? There’s still not a great deal online, but I’m seeing more and more angry people posting every hour. I have a guess: EasyBits paid Skype for the install. This is the crapware business model, in which a company pays a hardware or (less often) software vendor to install stuff that the customer did not ask for, and pays by the install. This is typically trial version software, and the crapware vendor benefits when customers cluelessly upgrade to paid versions. The crapware business model is why I no longer buy retail PCs, which come so clogged with crapware that they can barely move. I buy either custom-built machines or used corporate machines like the SX280 USFF, which were never retail machines to begin with and came with no crapware at all. This is a guess, but it makes sense. Why else but money would Skype do something so absolutely certain to get them crucified in the blogosphere? With my tinfoil hat on I could imagine that certain parties at Skype aren’t happy with being assimilated by the Borg and are getting some parting shots in. It’s too late to foul the deal, but anything that makes Ballmer itch in bad places might be worth it to them. Finally, if this happened to you, let me know in the comments or by email. It seems like a lot of people got hit with this, at least those running current versions of Skype. What if the entire installed base of current Skype instances pushed EasyBits Go down the pipe and onto user desktops? That would be a freaky thing indeed, and will make them a Mordor horde of enemies. Stay tuned. UPDATE: I cranked up an old XP SP2 machine with Skype 5 installed this afternoon and so far, the EasyBits install hasn’t happened. Will leave it on tonight and check it in the morning. It may be that the install requires SP3, Vista, or Win7. Heads up here; this is important: Something called EasyBitsGo.exe appeared in a directory under Documents and Settings/Application Data/All Users this morning about half an hour ago. The executable was already installed and running and wanted permission to install Flash Player. (I do not allow Flash Player on Windows machines, as it’s exploit fertilizer.) The timestamp on the executable’s directory tree indicated that it had been installed no more than a minute before it popped up. There appears to be a Skype connection, and I was using Skype at the time. Be careful. If you see it, close Skype, kill the easybitsgo.exe process in Task Manager to close it, and then nuke that directory. Then go to Add/Remove Programs and uninstall it. Reboot. If Skype did in fact install this thing without asking, it may be the beginning of the end of my own use of Skype. Per the above: Launch Skype. Select Tools | Options | Advanced, and un-check Automatically Start Extras. Then reboot again and make sure it’s not still running. If just rooting your Nook Color isn’t quite enough, here’s a description of how to turn it into a complete Android tablet. If it sounds scary to you, well, you may not have the computing experience to do it; but when I read the article I thought, Sheesh, that’s easy. You can even boot from the SD slot to get a sense for the mod before making changes to device memory. The process appears to be reversible, and the mod allows you to use Bluetooth-capable GPS receivers and other Bluetooth devices. Given how cheap the NC is, I’m tempted to try it while I wait for the high-end slates like Xoom to mature. We could maybe use a few more of these. The Wi-Fi element is a Cisco AE1000 USB 2.0 Wi-Fi adapter, connected to the PC through a 3′ USB extension cable. The female end of the extension cable is glued into a rectangular hole I made in the pill bottle’s white lid with a nibbling tool, and the AE1000 plugs into the adapter cable. Even with the number of pill bottles I have, finding this particular bottle was a huge break. I still have to figure a way to get the probe fastened into the hole by something better than friction, but that’s just engineering. The bottle works extremely well for another simple but fortuitous reason: It puts the long axis of the AE1000 right where the focus of the copper parabola falls. I tested for this out in the driveway in an interesting way: I pointed the parabola at the Sun as closely as I could, and then stuck a paper towel tube into the center hole to see where the sunlight would be most intense. The strongest part of the focus is about 3″ from the bottom of the bowl. (I didn’t leave the paper towel tube at the focus for very long, trust me.) This is just about where the AE1000’s antennas sit, if its interior construction is anything like the USB Wi-Fi dongle I sacrified some years back to see how it was done. For as lucky as I got, the position of the adapter isn’t especially critical. We’re not trying to create an image or even intense heat. We’re just trying to concentrate a distant microwave signal on the AE1000, and focus the signal that it emits into a narrower steerable beam. Nor am I going for moonbounce–the real mission of the device is to make sure I can get into the resort Wi-Fi access points when I’m at the Taos Toolbox writers’ workshop this summer. That always depends on where your room is relative to the access points, and in the past, I’ve pulled rooms in dead spots about two throws out of five. I’m going to do a larger article on the project once I tie the ribbons on it, and I’ll let you know where to find it when I do. Now that I have books to sell in more than one format, I need to erect some machinery to drive sales to more than one retailer. Time was, when all my books were conventionally published print books, a simple link to each book’s Amazon page was enough. Now I have a conventional print book, several POD print books, and ebooks in two formats. The Copperwood Press catalog page needs a total rewrite, and I’ve been working on that. (It’s one reason I’ve been a little bit scarce here.) One thing I did do today is mount a generic WordPress HTML window in the wide sidebar, and then fill it with thumbnails of all my books. The thumbnails will eventually be clickable links into the catalog, from which you will be able to choose your format and jump to a retailer. (I will not be mounting a cart myself; it’s far too much kafeuther if Amazon and B&N will both give me 70% margins on my $2.99 ebooks.) If you’re reading Contra on my WordPress site, look to your right to see the thumbnails. If you’re reading Contra on LiveJournal, go here. When you do, you’ll understand the conclusion I came to earlier today: My covers are not very thumbnailable. Some work better than others, and you can only do much with an image that’s 115 pixels high. I’m not an artist but I do know layout. The problem is that I learned it under the assumption that the purchaser would make his or her decision based on a much larger view of the cover, including true face time at bookstores. As I explained in my May 19 post, I’ve done well so far because I’ve published the sorts of books that people search for by name, as with Carl & Jerry. But if Cold Hands and Other Stories (now available on Kindle) is being browsed in the very big bin labeled “Hard SF,” the thumbnail cover image has a crucial selling job: getting above the noise represented by everybody else’s 115-pixel search results thumbnails. I’m not entirely sure what to think about the problem. If cover images get too small, they carry too little information to be useful. We can read the title in text beside the thumbnail; do we need to be able to read it in the thumbnail too? Will people get so used to minuscule cover thumbnails over time that they’ll basically stop noticing them? Subtlety and beauty have not always been the domain of book covers. Maybe this is yet another indication that we’re returning to the pulps: Our covers may need to become very small collections of iconic symbols (bug-eyed monsters, V-2 spaceships, traffic-cone breasts, ray guns) to be recognizable as anything at all. I’m not sure that worked for the pulps. I’m even less sure it will work for us. The real bummer is that I’m not sure what else to suggest. For the last several days I’ve been tinkering with my collection Cold Hands and Other Stories to get it ready for sale as an ebook. The book is now available in epub format on the B&N Nook store ($2.99; no DRM) and should appear in mobi format on Kindle in the next day or so. 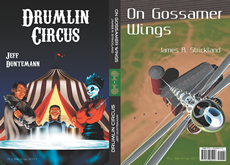 All of my shorter Drumlins stories are in that book, so if you liked Drumlin Circus and On Gossamer Wings, do please consider it. I’ve done well with my Carl & Jerry reprint books on Lulu for several years now because people go looking for Carl & Jerry. The audience knows the stories, many having read them in the 1960s. I have a substantial index page, and the page is the top search hit whenever anybody searches for “Carl and Jerry.” My two books on Old Catholic history are almost cult favorites by now, and I sell a couple of copies per month on Lulu without even a detailed summary page. (I do have descriptions on the Lulu storefront.) They sell when people talk about them in the many Old Catholic email groups, which is far oftener than I would have thought. I mention them in a post now and then, and the books keep selling. Word of mouth works well within close-knit enthusiast groups like that who understand what the books are about. Breaking in to SF is harder. To sell paperback books of my SF I simply have to be on Amazon. That’s Lulu’s #1 issue. My Lulu books are sometimes listed and sometimes not, for reasons I don’t really understand. A search just now for Cold Hands and Other Stories does not show the book, and that’s unacceptable. So I’ve been giving CreateSpace a look. It’s Amazon’s in-house POD service, and was originally called BookSurge before Amazon broadened it to embrace other kinds of content, like music CDs. I can use my own ISBNs there, and if you publish on CreateSpace, you will be listed on Amazon. CreateSpace is more complex to use than Lulu, though it has nothing on Lightning Source. If you’re serious about publishing your material and expect to sell more than four or five copies it’s worth studying. The economics are better, and I’ll close out this entry with a quick summary. First, Lulu: Cold Hands and Other Stories has a cover price of $11.99. Lulu’s per-copy manufacturing cost for the book (232 pages) is $9.14. Lulu’s commission is 57c, leaving my per-sale take as $2.28. That’s as complex as it gets over there. They don’t state a fixed unit manufacturing cost, but they tell you how much you’ll make in the various retail channels. The “Pro” option here is a $39, one-time-per-title cost that has to be earned out before you see any profit. (I think of it as a processing fee for the title, while allowing CreateSpace to compete with Lulu on the “free to post” issue. There’s no charge to mount a book, if you’ll take less per copy.) For Cold Hands that would be about twelve copies, depending on the channel mix. The eStore figures are for sales through CreateSpace’s online system. The Expanded Distribution option is for sales made through other online retailers and independent print booksellers. Obviously, if you’re going to drive sales, it pays to drive them to the CreateSpace eStore rather than simply referring them to Amazon. I had originally intended to mount Cold Hands on Lightning Source, but I wanted to get some real-world experience with CreateSpace. It’s not up there yet (their review process takes a couple of days) but should be there by early next week. The missing link, of course, is a Web page to drive sales to CreateSpace, and I’m working on that. More as it happens. It’s been a rough week here (hence the current post paucity) and I just got Carol on a plane to Chicago to look after some unexpected family issues. As we left the driveway it was snowing like hell again, this on the morning of May 15. Even today, halfway to lunchtime, it’s still gray-grim and 39 degrees. I guess it’s going to be another indoors week. Much planned for coming days, including the ebook release of Cold Hands and Other Stories. Stay tuned. I stopped in Denver on the way home from the airport to pick up some Elfa parts to expand the shelf system in the back of our garage. It’s an Erector set for storage, and if you don’t know about Elfa I think it would be worth taking a look. I have a hodgepodge closet in my workshop downstairs that desperately needs to be Elfa-whacked, and it’s on the project list for this summer. I used to spend a lot of time poking around in Google Earth, mostly looking for abandoned railroad right-of-ways near where I’ve lived in the past. Since then The Daily Google Earth has appeared, full of interesting things visible from space. Today’s desert triangles post intrigues me, since my parents bought land in that general area in the 1960s and I still own it. Carol and I have moved incrementally to CFLs as our incandscents have died, but the can fixtures we have in our ceilings are too narrow to pass the necks of CFL floods. Alas, this promising new technology won’t fix that (the necks are, if anything, wider) but it’s a promising alternative to incandescents and doesn’t contain mercury. As the author suggests, it won’t be long before the Maker community figures out how to focus the output into a beam and perhaps even scan it across the bulb’s face. I’m not generally one for weird case mods and exotic custom cases, but this Priarie School item engenders a certain amount of lust. I also realize that I could easily make a case of Stickley-style dark-stained quarter-sawn oak–not that I need another thing to do. Would be killer cool, though. As a programmer guy with old roots in embedded systems, I feel a very deep itch to try the Android Open Accessory Kit. Alas, as an SF writer with only so many hours in the day, I may not get to it soon. But I greatly rejoice that it’s even possible. The data caps issue has gotten to the WSJ, which probably means that it’s off geek turf and Really Quite Sincerely Real. What few people are talking about with respect to ISP data caps these days is the perverse incentive they present for video piracy: Why pay an additional “bandwidth tax” on your favoite films each time they’re streamed when you can download them once and watch them any time you want without further payment? This has always been the case, but moving to a metered Internet only makes it worse. From the ‘Bout-Damned-Time Department: Samsung’s Galaxy line of phones and tablets will be getting its Gingerbread update any day now. We hope. Any day now. Guys, really? Bruce Baker sent me a link to sculpture made of books, sculpture as I suspect termites understand it. The last picture made me cringe a little: It’s a carved-up copy of all three volumes of the 1936 New Century Dictionary, which has been my go-to word source now for almost thirty years. What other dictionary (none here!) can show you drawings of a wanderoo and a wanigan on the same page? Not all engineering problems are nice and clean and up on top of a well-lit bench. Especially this one. If ebook readers ever push print books over the edge of the world, it’ll be due to much higher resolution displays. This one, at 458 DPI, is very close to what you see on mass-market four-color interior printing. At 600 DPI (and we’ll be there in a few years) the war will be over. Inevitable: I Can Has Zeppelin. If the cover image above seems bizarre to you, well, you’re younger than you look. The grayhairs among us know precisely what I was reaching for: The Ace Doubles of the period 1952-1973. Each volume consisted of two short novels from 25,000-50,000 words in length, bound back-to-back and inverted, each with its own cover image. Ace did not invent the physical print/bind arrangement, which is called tete-beche (head-to-tail) and has existed for almost 200 years. They did make it a mainstay of recreational reading for two decades, and most of us back then had a pile of them. A lot of people thought it was a weird idea (and many made fun of it) but we forget that the short novel as a form essentially vanished from SFF after Ace stopped publishing doubles. The magazines won’t publish something 40,000 words long, and 40,000 words is too short for a conventional print book unless you’re way out there in small and very small press. So there was this huge hole between 20,000-word novellas and 80,000 word novels. I fell into that trap in 1981, when my Firejammer clocked in at just under 30,000 words. I shopped it, but unless you’re Larry Niven no one’s going to seriously look at something that length. I like the short novel as a distinct literary form. It’s long enough to develop some ideas and a few interesting characters, but short enough to require a certain focus, and a fairly linear plot line. It deserves to have a place in the SFF world, and two recent developments have conspired to give it one: ebooks and print-on-demand publishing. Ebooks have no strong length requirements, and from what I’ve read, the length of original ebook novels is drifting downward. More to the point, a story can be given the length it needs, and authors aren’t under pressure to pad an idea out to print novel length, or compress it to magazine novella length or less. Print-on-demand publishing allows publishers to try interesting things without betting the house on the outcome. I will always love print books and still buy them in respectable quantities, but in these troubled times print publishers must be conservative to avoid going broke. (Do I know a little bit about that or what?) The beancounters require that a book recoup its capital costs, which means that books hover within certain boundaries set by retailer expectations. (Remember that if retailers won’t stock a book, customers never get the chance to vote on it. Retailers therefore have what amounts to a veto on print publisher publishing programs.) Slightly whacky things like tete-beche double novels fall outside ordinary bricks’n’mortar retail channel expectations, but POD manufacturing and online ordering make a lot of things possible. So I offer you a book with two covers, and two authors telling two stories in one world, the Drumlins world that I introduced in Asimov’s back in 2002 with “Drumlin Boiler”. There’s much more to say, and I’ll continue the discussion (with specifics on both stories) in days to come.